DCS - Samba De Amigo Ver 2000 REVIEWED! The original Samba de amigo [SDA] came out on the 8th December, magazines raved about it, but they didn't have to pay £75 + for it. The game went on sale in extremely limited numbers, for the whole game was only given a limited run. SDA was a great game and Sonic Team released an updated version called Samba De Amigo Ver 2000, but sadly only in Japan. So what does the new version offer? Well Samba De Amigo Ver 2000 [SDA2000] pretty much features the entire original game, minus the mini games. All the old songs are included with the exact same musical patterns. But best of all is the brand new music tracks that have been added. For all you music buffs the complete track listing is below. The later tracks, like the ones taken from Sonic Adventure, Nights, and Jet Set Radio have to be downloaded off the internet via the internet option in the game. But as ever the tracks are actually on the gdrom, so just edit you save file and voila. 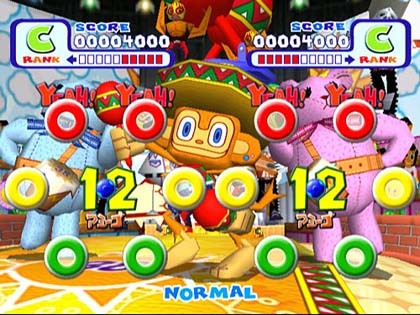 The game can be played with or without the maraca's. The basic premise is to shake the maraca's in the direction that the coloured balls go. Playing with the pad is very easy, the set up has been created to give the impression of shaking maracas. Basically the left hand side of the board [the 3 circles] are control by the d-pad, whilst the right 3 circles are control by the buttons. It will take you a while to get use to it, but after a few goes it works amazingly well. Different music tracks have different patterns, fast tracks have balls zooming all over the place whilst some of the slower tracks require you to have perfect timing. A dance mat can also be used, its purpose is to make you look a pratt - no really. It's second purpose is to allow you to do some poses when you are told to. 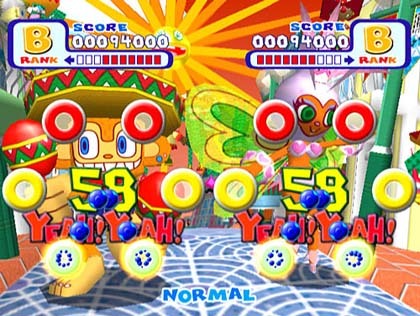 Samba de Amigo ver 2000 works best as a two player game, a very expensive two player game if you both wants mats and maracas, but Samba is pure fun, something missing recently in games. SDA2000 is a Japanese game and for a change all the menu text is in Japanese, fortunately they are coloured co-ordinated, so blue is 'versus' mode. Seriously deciphering the menu will not take long, and the rest of the sub menu's and game lead up screens are all in English. SDA2000 can be picked up very cheaply, so invite some girls around and ask them to play with their maracas. If they slap you, explain that you were referring to SDA2000, otherwise sit back and enjoy the site. 7 Colourful, crazy animals dance along to the musical beats. Sound 10 With loads of top quality tracks, and Ricky Martin you cannot complain. Gameplay 8 Two player is where this game is at. The challenge is found in the track selection. A game you will keep coming back to just to hear the excellent past sonic team game tunes. "Samba de Amigo = Maraca mayhem."